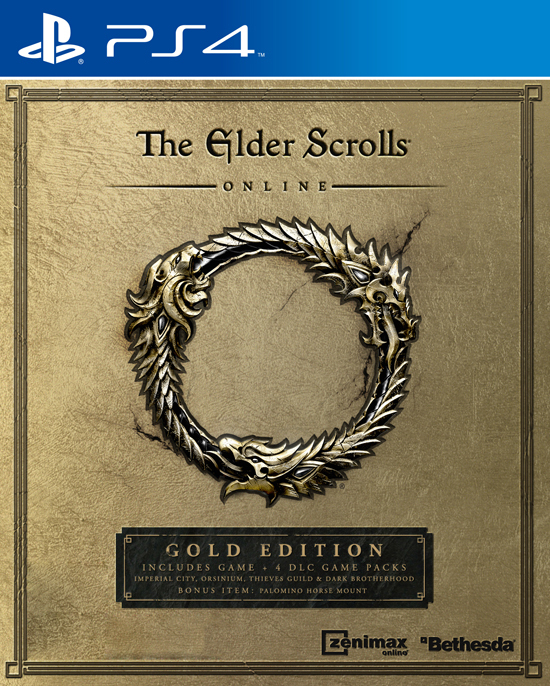 The Elder Scrolls Online: Gold Edition for Xbox One, PlayStation 4, and PC, introducing a new and easy way to get the entire award-winning The Elder Scrolls Online story, as well as all four major DLC Game Packs, all in one convenient package. From Skyrim to Daggerfall, this will be the easiest way for new players to explore all of Tamriel and take part in amazing adventures online with friends, from battling for control of the capital of Cyrodiil to venturing into the secret enclaves of the Dark Brotherhood on the Gold Coast. Existing players can also now add all four DLC Game Packs to their game with the new Guilds and Glory DLC pack, now available via the in-game Crown Store for a discounted price of 5,500 Crowns. For existing players who have yet to jump into the DLC Game Packs, the Guilds and Glory bundle pack is now available, offering all four major DLC Game Packs in a single bundle for a special low price via the in-game Crown Store. Players can now instantly get access to all of the great content in Imperial City, Orsinium, Thieves Guild, and Dark Brotherhood for only 5,500 Crowns (original price for all four DLC Game Packs was 9,500 Crowns).